To me, Alicia Keys has written the political song of the decade unbeknownst to her. She was writing about love or whatever but the lyrics capture my feelings and concerns for the troubled environment in the political/policy arena. The arena stinks out loud these days. People are more interested in fighting the opposition than building solutions which improve our great nation. Is the tail wagging the dog because people in official Washington are battling and giggling while the rest of the nation scratches our heads. Look, I don’t hate members of any political party and hope that leaders can constructively dialog with each other. While television fuels intramural conflicts among Americans, I personal believe (like General Colin Powell) that a silent majority of people in the political center and seeks healthy communication at the policy-making table. I feel sorry for those who live for negativity and thrive on angst. My life is too short to spend it bitter—that takes too much energy. We should look at A. Keyes words as if they were written to ugly-acting political folks on both sides. To be hopefully, I personally feel that we have many good-hearted Americans in the arena. To start, I like the spirit of Barrack Obama, Jon Huntsman, Condi Rice, Colin Powell, Hillary Clinton and Jeb Bush. Also, the guys at No Labels are on the right track. As readers of this blog know, I am a moderate Dem who votes for good people with secondary regard for party. I am more interested in solutions, peace and regional issues. Plus, good old plain talk is music to my ears. In my community, the leaders that get us back to self-reliance and away from governmental preoccupation will be golden. Politically, I am a brand new kind of me and I feel better than I did during my hyper-partisan college years. Is anyone with me? 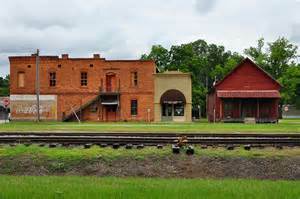 I know that rural southerners generally seek the good in people and situations. Moderates need to use the coming Georgia U.S. Senate race as an opportunity to flex our “king making, scale tipping” muscles. Sen. Saxby Chambliss is an old school pro-business Republican rather than a new school pro-crazy drama starter. The far Right wants him gone and they want him to take any member of congress who talks with the other side with him. No. The extreme radical element of the GOP shouldn’t run Georgia or America. They are small in numbers yet vocal and crafty. Well, the reasonable center is huge and somewhat homeless regarding political parties. Since Georgia is a red state because the Democratic Party is poorly organized, Saxby’s replacement will likely be decided in a July primary rather than a November general election. Rep. Sanford Bishop, Rep. John Barrow or Atlanta Mayor Kasim Reed could beat a Tea Party candidate but that is too risky. Moderate Democrats must consider the possibility of swaying the Republican primary to a Saxby-like conservative. This move keeps a zealot out Georgia’s Senate office. Personally, I would pick Rep. Austin Scott or Rep. Jack Kingston because I want one of the two Senators to come from south Georgia and have a history of serving agriculture and military areas. Since rural Georgia Democrats are as conservative as California Republicans, we can dig the whole no labels approach to governing—voting for a less bitter conservative would be easy. We need solutions; we need peaceful dialog. We need someone who will join with the Blue Dogs, Jon Huntsman, Barrack Obama, Condi Rice, Jeb Bush and Colin Powell to get about the business of fixing what is broken with our government and our mindsets. The buzz around Georgia politics is that Eric Erickson of CNN and Red State might challenge Sen. Saxby Chambliss. Saxby (he told us to call him that) was nice to me once a long time ago during a congressional ag staffers visit to Taylor County, Georgia, and I will never forget that. He leaves when he is ready to go and if the far Right wants to push him for rebuffing his 20 year old tax pledge, their primary numbers can be replace by crossover moderates. Perhaps, Erickson of Bibb County could get the House of Representatives seat when Austin Scott exits for the U.S. Senate. The polarization of the electorate that we have experienced in the last few years could be seen coming from a mile away. I have always thought of Austin as a trendsetter who might be a great national leader and we are at a pivotal time when such leaders should emerge. Actually, the conservative movement would look better in my community if the recent election results moved them to listen to Republicans like Jeb Bush and Jon Huntsman. The Democrats should start developing future Senate candidates closer to the middle modeled after Rep. Sanford Bishop and the Republicans should do the same with Austin in mind. Isakson and Chambliss are more statesmen at this point than politicians and that is a good thing. I was thinking about the past, present and future Georgia congressional delegation while watching the legislative maneuvering in the movie Lincoln. Austin Scott has that House seat on lock but he should function like a person who wants to win statewide in the future based on relationships and connections cultivated now. What would old Abe do? Xcape’s “Understanding” had a line that said, “You don’t really know me… you just want’a do what you want’a do… that’s not the way it is baby…you gotta listen to me.” That line applies to elections, politics and policy because the South has a history of leaders and parties who arrogantly want to make desicisions for everyone without input from or understanding of everyone else. I am an American who is concerned that the so-called developing world could blow past our nation in this century because those hungry people are driven liked we once were. Simply put, we might get out hustled by Latin America, South America, Africa, Eastern Europe and Asia because their young people aren’t playing when it comes to education and training while too many of our youth are soft whiners. We must understand that the entire nation must be striving collectively. 1.President Obama can’t improve your life alone. He can only foster an environment conducive for your personal development. That’s what he said from the moment he stepped onto the national stage but folks don’t know how to listen. 2. Newt Gingrich as president could actually be good for my community. While we never know which version of Newt will show up, Speaker Gingrich from the Clinton era was a great ideas person who sincerely wanted to change the cultural mindset of Americans in a positive way. Look: the government doesn’t now nor has it ever cared about the average person. With Newt as president we would know that fact without a doubt and get about the business of personal responsibility. 3. Jon Huntsman is the most Obama-like Republican and moderate Democrats should vote for him to encourage the GOP nominee to make him their VP candidate. As quiet as it is kept, Obama respects Huntsman more than he does most of the Congressional Black Caucus. If the GOP takes the White House, moderates will wish level-headed Huntsman was at the table. 4. A small percentage of Democrats could sway the GOP presidential primary. “Ted, is right..we should vote for Huntsman just in case Obama doesn’t win or Newt to help Obama win.” Of course, no one understands my points until after the fact. 5. In South Georgia, running someone against Sanford Bishop will crank up Bishop’s campaign apparatus and organize Democrat GOTV efforts in Albany, Columbus and Macon. If President Obama wins reelection by a slim margin and by surprisingly winning Georgia, Bishop’s opponents can be thanked. By the same logic, Democrats can’t beat Austin Scott so we shouldn’t run anyone against him. That energy would be better spent developing a functional relationship with the young lawmaker. Bottomline: Using the “Understanding” song in a blog post is recycling a past post. Another past post is my notes from “The Art of War.” That Chinese warfare manual is like a blueprint for politics and modern business. A central theme in the book is respect for and understanding of the other side. If the GOP understood Democrats, they would select Huntsman as their nom but the hardheaded never learn. If the Dems understood the Tea Party, they would vote for Huntsman in the GOP primaries in droves to keep them out of the White House. But, we are more concerned about the NFL playoffs.